Fred Hampton would be glad for the unprecedented unity that the struggle against the DAPL has brought to Native peoples. 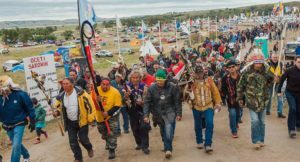 Native Americans from more tribes have joined together at Standing Rock than for any other movement. I’ve heard, personally and through social media, of many Native Americans who say that this movement has brought hope that Native peoples will be able to fight for justice in a more united way than ever before. That this could be true after centuries of genocide and cultural devastation is a sure sign of hope and inspiration for Native Americans and for all those who struggle against oppression. Surely, Fred Hampton would be glad. 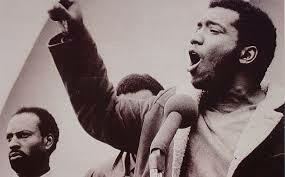 Fred Hampton would be glad for the unity of all races and creeds who came together to support the Sioux. As he said in many of his inspired discourses, what united the people was far stronger than what divided them, and the divisions were a distraction from fighting oppression. He built bonds of peace across racial and ethnic lines in his Chicago community. Fred Hampton would be glad for the common unity found at Standing Rock, a source of the people’s power. Fred Hampton would be glad for the power of the people’s peaceful protest. Yes, there may have been a few yahoos who threw beer cans (or some such) at police. But that shouldn’t distract in the slightest from the thousands who peacefully stood against millitarized law enforcement brought in from all around the country who met them with violence and used despicable tactics that risked the peoples’ lives in freezing temperatures. Fred Hampton would be glad that veterans who had been sent to fight unjust wars came to join and defend the people, some saying that they felt like this would be the first time they had truly served their country. Fred Hampton would be glad for this people’s victory to strengthen them in a gathering storm. Surely he would not have been surprised that the people now face an incoming presidency that built its movement by exploiting racist sentiment and by seeking to delegitimize the first Black President through the most craven and vile means. He was too smart to think that the US could be past something like that, even half a century later. Then let us put our own naivety away. Let us awaken to our common interests, and to the threats that loom against us from the incoming presidency and the forces that put it in power. Let us carry the banner of liberty, freedom, justice, and equality against the forces of “(“economic”, “white”) nationalism” and “populism” which are only covers for fear, resentment, and the powerful who exploit them to their own ends. Let us have the courage to fight on. Let us make Fred Hampton, may he Rest In Power, glad.